Here She is!! The desk that meant helping my girls clean their room for 4 hours, a migraine and a whole lot of fun! Remember my Goodwill haul last week. Well you know how impatient I am. Even though it was absolutely freezing out, I went out to the garage and painted her. I wanted her to match the girls other furniture so I went with just a straight up white. It was very start and the girls other dressers were a bit more "aged" but I knew once I waxed her she would tone down a little. So here she is out in the garage, all getting pretty and everything. and here she is all ready to be painted sitting in my living room. and here she is.....in all her glory in my girls room. I even got a shot of the desk with my birch painting that I did for my girls last Christmas. Thanks for stopping by and have a BEAUTIFUL day!!! Oh Karin! I just love it, so pretty! Wow!! That's all I got! WOW!! Just visiting from my Dashboard, but dying to see what parties you'll feature THIS desk at this week. PLEASE do Miss Mustard Seed's!!!!! WOW! You are such a great artist!!! It looks amazing! A beautiful masterpiece, truly lovely! Hugs P.S. Please add your sweet blog to my blog list page and don't forget to enter the Tis The Season Giveaway it ends soon. Stunning! Love it, love it. Whoa! that is the most beautiful desk I've ever seen after a redo. I must look around as I'm just visiting from the link party. This is so gorgeous! I just picked up a cream desk at a garage sale, and was thinking of doing something similar with a stencil. This reinforces my choice. You did a beautiful job! It is GORGEOUS!!! I LOVE it!! This is so elegant and beautiful! Such talent! As soon as I saw your thumbnail, I knew this was you! It's beautiful! How could I NOT party after all the effort to post this evenin', Karin! Here, have some Chai Tea!! The art work is amazing and the desk is so beautiful....love it!!! Thank you for linking up! I featured this beautiful desk this week! Come by and grab a button! GOT YOUR CARD TOO! Still have to send ours to you! Another stunning piece! Just gorgeous! The girl has skills. Love it!! Boy, I sure wish I could paint like you, but I don't. I don't think one could paint when all their life they're heard they've had the worst handwriting in the world. Oh well I have other talents. It is beyond gorgeous. Would you share this over at Sunday's Best going on now. Hope so, sharing is a good thing! The desk is beautiful! You did a wonderful job!!! Show off! ;D Game on! And all I've got is some silly rocking chair this week! PA-lease...I gotta get busy! This piece ROCKS! Still has beautiful as the first time I saw it, really a great job. Your are talented. Thanks for sharing at Sunday's Best and wishing you very happy holiday's. That is absolutely beautiful! Please come share more of your beautiful ideas at emosaicideas.com on out blog carnival! absolutely beautiful! you did a fantastic job! i wish i had your talent. thank you for linking up at cap creations. be sure to come back each friday to share your thrifty finds. I saw your creation on Uncommon Designs. Your manger is beautiful and touching. And I like that a child could make this as well. 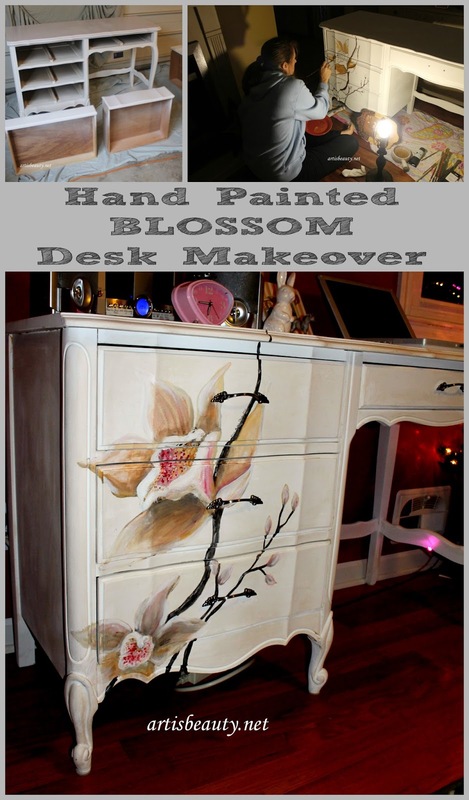 Karin, I'm featuring your beautiful blossom desk at Project Queen tonight. Thanks so much for linking up this past week. Just Beautiful!!! I wish I had half your talent.